The Sora Raku “Tenku” drone used in the trial is controlled using NTT DOCOMO’s LTE high-speed wireless communication network. 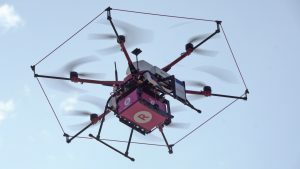 Rakuten, Autonomous Control Systems Laboratory Ltd. (ACSL) and NTT DOCOMO have collaborated to carry out the world’s first test flight of a drone delivery system using an LTE network. Held on November 22, 2016, the flight saw Sora Raku’s “Tenku” drone carry merchandise from a beach located in Chiba City to the nearby Inage Seaside Park. Chiba City is a National Strategic Special Zone, a region specifically designated by the Japanese government to promote internal competitiveness and the economy through regulatory reform and other measures. 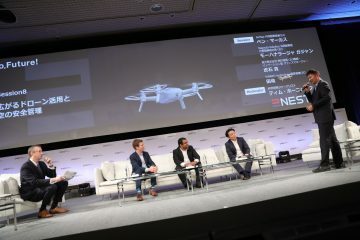 The test flight was carried out to demonstrate that remote operation of a drone via NTT DOCOMO’s LTE high-speed wireless communication network was possible and to test Sora Raku’s new drone dashboard monitoring system. The drone successfully delivered goods to the Inage Seaside Park in Chiba City. The drone used for the flight was the new version of Sora Raku’s Tenku drone. Based on ACSL’s new airframe called “PF1,” which was designed for future flight over water and urban areas, the new Tenku model is capable of long-distance flight, and is equipped with a parachute to slow its fall in case of an emergency. The drone also features a number of improvements over the previous model, including water resistance and easier maintenance. At the Inage Seaside Park, the mayor of Chiba City, Toshihito Kumagai, placed an order for a book and mobile phone battery using a dedicated app. 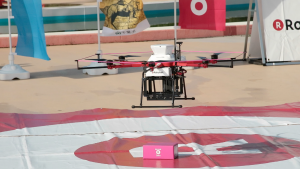 While the goods were loaded onto the drone at the nearby park, a team located in Rakuten’s Head Office in Tokyo used the new drone dashboard to prepare flight instructions and then, with a touch of the screen, instructed the drone to depart. After flying autonomously over the sea to the park, a distance of around 700m, the drone landed safely, dropped off the package and returned to the beach. 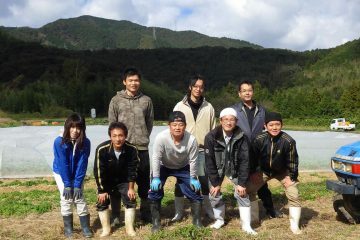 Chiba City Mayor Toshihito Kumagai, who attended the trial, said he “caught a glimpse of the future” with the delivery. Speaking at the event, Mayor Kumagai commented that he felt he had “caught a glimpse of the future” with the delivery. 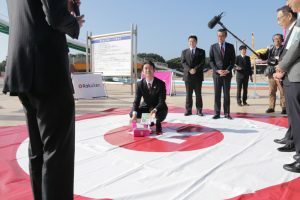 For Hideaki Mukai, leader of the Sora Raku drone delivery project, the success of this test flight is another feather in his cap, following on from their drone delivery service at Camel Golf Resort and the inter-island test flight carried out in Imabari City, another National Strategic Special Zone. 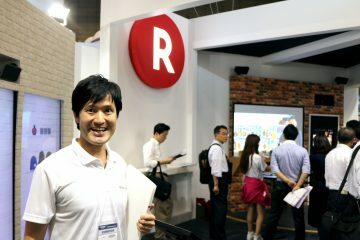 According to Mukai, one of his team’s goals is “to use drones to transport goods from Rakuten’s logistics hub, the Rakuten Fulfillment Center in Ichikawa City, to Makuhari New City in Chiba.” Mukai aims to realize this goal by 2020. With their string of successes and the speed at which the Sora Raku project is progressing, the next three years are sure to be interesting.